Robin Williams was an American stand-up comedian and actor. Robin Williams voiced the character of Genie in the animated movie Aladdin. The majority of his lines were improvised. His full name was Robin McLaurin Williams. Robin Williams idolized Richard Pryor and Jonathan Winters. Robin Williams was born on July 21, 1951 in Chicago, Illinois. Robin Williams was married to his second wife Marsha Garces from 1989 to 2010. She had been his son Zachary's nanny and was pregnant at the time. Robin and Marsha had two children together, in 1989 and 1991. His father, Robert Fitzgerald Williams, was a Ford Motor Company executive, while his mother, Laurie McLaurin (née Janin), was a former fashion model. Robin Williams' third wife was Susan Schneider who he married in 2011. Williams had two elder half-brothers named Robert and McLaurin. Robin Williams won one Oscar, two Emmy awards, a total of 7 Golden Globe Awards, 4 Grammy Awards, and 2 Screen Actors Guild Awards. He had English, German, French, Welsh, Irish, and Scottish ancestry. Robin briefly studied political science before enrolling at Juilliard School to study theatre. Williams left Juilliard during his junior year in 1976 at the suggestion of Houseman, who said there was nothing more Juilliard could teach him. Gerald Freedman, another of his teachers at Juilliard, notes that Williams was a “genius” and that the school’s conservative and classical style of training did not suit him. No one was surprised that he left. Robin Williams was a cycling fan and was known to train with Lance Armstrong. After leaving Juilliard, he performed in nightclubs where he was discovered for the role of “Mork, from Ork”, in an episode of Happy Days (1974). producer Garry Marshall gave Williams his own sitcom, Mork & Mindy, which ran from 1978 to 1982. The show was a hit and established Williams as one of the most popular comedians of the ’70s and ’80s. Two of Robin Williams' movies hit $100 million at the box office in 1996 - The Birdcage and Jumanji. Williams’s early movie appearances included leads in Popeye (1980) and The World According to Garp (1982). His first major break came from his starring role in director Barry Levinson’s Good Morning, Vietnam (1987), which earned Williams a nomination for the Academy Award for Best Actor. Williams was allowed to play the role without a script, improvising most of his lines. Over the microphone, he created voice impressions of people, including Walter Cronkite, Gomer Pyle, Elvis Presley, Mr. Ed, and Richard Nixon. Robin Williams' first wife was Valerie Velardi. They had a son Zachary Pym Williams in 1983. Robin and Valerie divorced in 1988.
teacher at a preparatory school in Dead Poets Society (1989). He appeared in the hit Penny Marshall drama Awakenings (1990) with Robert De Niro and Julie Kavner, and received his third Oscar nomination for his role as homeless man Parry in the 1991 redemptive drama The Fisher King. Disney’s animated film Aladdin (1992). One of his most memorable comedy films was Mrs. Doubtfire (1993) in which he pretends to be a woman so that he can be closer to the kids he has with his ex-wife. Although Popeye was not a hit Robin Williams went on the star in The World According to Garp. He reached a unique milestone by having two of his films reach the $100-million mark in the US exactly the same week: Jumanji (1995) and The Birdcage (1996). His penetrative acting in the role of a therapist in Good Will Hunting (1997) deeply influenced some real therapists and won Williams an Academy Award. Robin Williams was cast as Popeye in 1980. For the next few years, Williams took on a range of roles. He starred as the doctor who treated his patients with humor in Patch Adams (1998) and then portrayed a Jewish man in Germany during World War II in Jakob the Liar (1999). Based on a work by Isaac Asimov, Bicentennial Man (1999) gave Williams the opportunity to play an android who develops human emotions. And he returned to voice acting as Dr. Know in A.I. : Artificial Intelligence in 2001. In the 2002 film Insomnia, Williams portrayed a writer/killer on the run from a sleep-deprived Los Angeles policeman (played by Al Pacino) in rural Alaska; in the same year he portrayed a psychotic photo-lab technician who stalks a suburban family in One Hour Photo. The writers of Mork & Mindy left gaps in the script because Robin was so good at improvising they had to leave room for him to do so. A 2002 stand-up performance led to the hugely successful Robin Williams: Live on Broadway (2002), which was released as both an album and a video. While working on Mork & Mindy Robin Williams developed an addiction to drugs and alcohol. It lasted more than 20 years. Williams again returned to voice acting provided voices for several animated films including Robots (2005), Happy Feet (2006) and Happy Feet Two (2011). He portrayed Teddy Roosevelt in the comedy Night at the Museum (2006) and two sequels (2009, 2014). In 1978 Robin Williams got his first big break. He landed a role on Happy Days as Mork. Mork became the main character in the TV show Mork & Mindy, which also starred Robin Williams. In World’s Greatest Dad (2009) Robin Williams, plays a much-put-upon high school teacher and father who tries to airbrush the circumstances of his teenage son’s freak death and, as an unexpected result of the lie, becomes a local hero. In 2011 Williams—who had appeared in a 1988 Off-Broadway production of Samuel Beckett’s Waiting for Godot—made his Broadway acting debut in Bengal Tiger at the Baghdad Zoo, a surreal comic drama set during the Iraq War. In 2013 he returned to movies, portraying a priest in the star-studded farce The Big Wedding and U.S. President Dwight D. Eisenhower in Lee Daniels’ The Butler. diagnosis in the comedy The Angriest Man in Brooklyn (2014). Boulevard (2014), in which he played a closeted gay man who befriends a male prostitute, was released after his death. Williams received two Emmy Awards, seven Golden Globe Awards, two Screen Actors Guild Awards, and five Grammy Awards throughout his career. Robin Williams had a net worth of $50 million dollars. In 2014 Robin Williams committed suicide. He was 63 years old. He had a disease called Lewy body dementia. While living in New York City Robin Williams performed as a mime to earn money. His first marriage was to Valarie Velardi in 1978 with whom he had a son Zachary Pym “Zak” Williams (born 1983). Williams and Velardi divorced in 1988. On April 30, 1989, he married Marsha Garces, Zachary’s nanny, who was pregnant with his child. They had two children, Zelda Rae Williams (born 1989) and Cody Alan Williams (born 1991). Williams and Garces divorced in 2008. Williams married his third wife, graphic designer Susan Schneider, on October 22, 2011, in St. Helena, California. The two lived at their house in Sea Cliff, San Francisco, California. On August 11, 2014, Williams committed suicide by hanging at his home in Paradise Cay, California. His wife attributed his suicide to his struggle with Lewy body dementia. He developed a drug and alcohol problem while working on the sitcom Mork and Mindy, and would struggle with addiction for more than two decades. Robin Williams' classmates at Juilliard School included Mandy Patinkin, William Hurt, and Christopher Reeve. Williams was a casual friend of John Belushi, and the sudden death of Belushi due to an overdose, together with the birth of Williams’ son Zak, prompted him to quit drugs and alcohol. In 2003, Williams started drinking alcohol again while working on a film in Alaska. In 2006, he checked himself in to a substance-abuse rehabilitation center in Newberg, Oregon, saying he was an alcoholic. 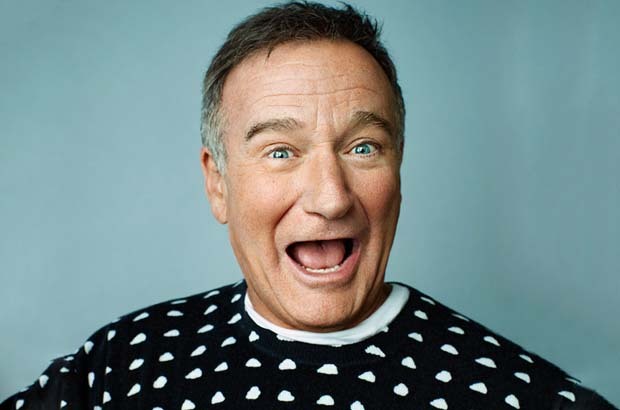 In mid–2014, Williams admitted himself into the Hazelden Foundation Addiction Treatment Center in Lindstrom, Minnesota for treatment for alcoholism. In 1986, Williams teamed up with Whoopi Goldberg and Billy Crystal to found Comic Relief USA. This annual HBO television benefit devoted to the homeless has raised $80 million as of 2014. Williams was a huge fan of the BBC comedy series Monty Python’s Flying Circus (1969). Robin Williams had heart surgery in 2009 to replace his aortic valve. He was a huge fan of the sport of Rugby Union, and in particular New Zealand All Black star Jonah Lomu, who flew to San Francisco and gifted him with a signed All Black jersey. Williams enjoyed cycling and occasionally trained with Lance Armstrong. Robin Williams, Billy Crystal, and Whoopi Goldberg founded Comic Relief USA in 1986 to benefit homeless people. By 2014 the annual television show had raised over $80 million. Williams studied at Julliard with actor Christopher Reeve. The two remained good friends until Reeve’s death in 2004. One week after Christopher Reeve’s tragic horse-riding accident, Williams visited him in the hospital. However, he was dressed from head to toe in scrubs, spoke with a Russian accent, and had a surgical mask on. He was acting as if he was a real doctor and did a bunch of wacky antics. After he took off his mask, Reeve stated, “That was the first time he laughed since the accident!”. In 1997 he was voted funniest man alive by Entertainment Weekly.